Whether you’re looking to soften up your cuticles, get silky feet or revamp the way they look, a pedicure can go a long way in giving you what you want. With the number of colors and styles out there, you’re likely to want to change your nail polish on a very regular basis. We’re here to show you how to get a gorgeous DIY Vine Vera Pedicure so that you don’t have to spend hours in the salon week in and week out. Unfortunately, the only problem with a DIY pedicure is that you have to do everything yourself – including preparing for the pedicure. However, it just takes a few minutes and can be very relaxing. 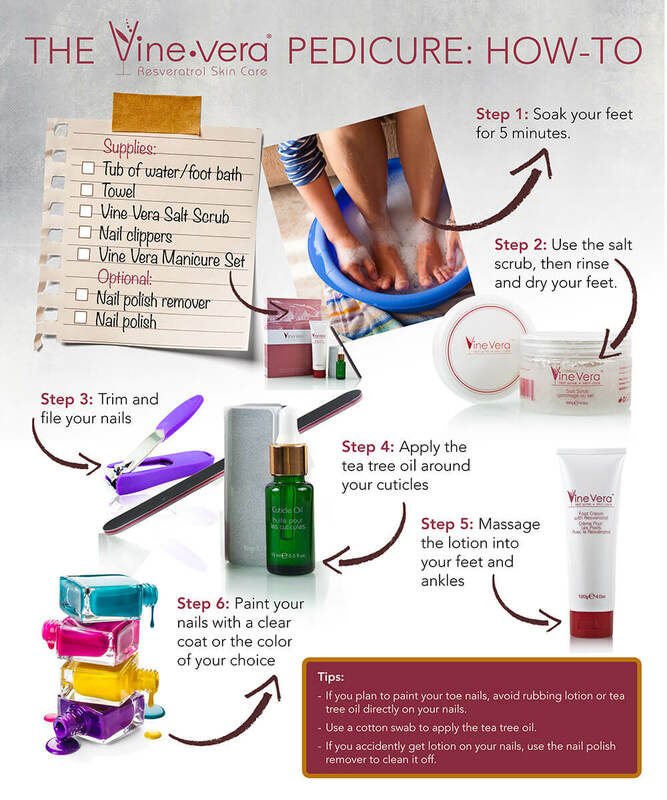 Enjoying an at home pedicure with your Vine Vera manicure set may be just the ticket to a relaxing evening at home! Never cheat by skipping on soaking your feet just because you’re at home. Soaking your feet is not just about cleansing them, it is also about preparing them for exfoliation and softening the skin to make it easier to remove dead cells. Remove traces of your old nail polish as the tub fills with warm water. Soak your feet in the water for about 5 – 10 minutes before moving onto the next step. Switch on some music if you’re getting bored. Use the Vine Vera Salt Scrub to slough off those rough spots. Massage each foot for a couple of minutes with the Vine Vera Salt Scrub before rinsing it off with warm water and drying your feet with a towel. Remember to always start off with your heels and work your way to your toes using small circular motions. Now that you have taken care of your skin, it is time to buff away those nails. Always trim your nails straight across and then give them a smooth look using a nail file. The key is to be gentle, yet firm. Make sure that you always use small steel clippers that are specifically made for toe nails. Giving your nails a rounded look can also help you to prevent ingrown nails. The Vine Vera three way buffer and nail file are both perfect for this step. Apply some Vine Vera Cuticle Oil around your cuticles. This will help you pump up the shine and to create a natural barrier to protect them from smudges. Apply Vine Vera Lotion to your ankles and your feet. Always use circular motions to massage all over your feet and also on your lower legs. Then, use your index finger knuckle to massage into the arch of your foot and also knead the heel. Repeat this action for the other foot as well. This helps you to boost circulation, reduce swelling and relax your feet. Before you apply the nail polish, you must always use a nail polish remover to get rid of tea tree oil and lotion residue from your nails. Next up, make sure that you apply a clear base coat. This helps you to ensure that the polish lasts longer and strengthens your nails if they are brittle. Once the clear coat dries out, apply a nail polish of your choice. Remember to start above the cuticles and sweep the bristles towards the tip of your toe. Don’t forget to add a second coat and a finishing top coat once you’re done with all 10 nails. If you plan to polish your toenails, make sure that you don’t rub tea tree oil or lotion on your nails. Always use cotton swabs while applying tea tree oil. Use nail polish removers to remove any tea tree oil or lotion that accidentally finds its way to your toe nails.